If your dog suffers from food allergies, you’ll need to take steps to eliminate the problematic ingredients in his diet. One of the best ways to do so is by selecting a dog food for allergies (or hypoallergenic dog food), which is made without any of your dog’s allergic triggers. Below, we’ll explain the basics of hypoallergenic dog food, discuss the things you’ll want to look for when picking one for your dog, and recommend the best dog food for allergies with 5 top options. What is a Hypoallergenic Dog Food? Food allergies occur when a dog’s immune system mistakes a harmless ingredient for a dangerous one. This causes the body to release antibodies to fight off the invader, and these in turn release histamines. Histamines lead to symptoms like skin redness, swelling and – most commonly for dogs who suffer from food allergies – itchy skin. To treat food allergies and help your dog feel better, you’ll need to identify the problematic ingredient through an elimination-challenge diet. Once identified, this ingredient can be avoided when you select a new food. This should stop the allergic reaction and allow your pet to enjoy some relief from skin allergies. However, for a variety of reasons, it can sometimes be difficult to determine the ingredient that causes your dog’s problems. In such cases, you’ll need to select a “hypoallergenic”or limited ingredient dog food. As it turns out, dogs tend to be allergic to a relatively small number of common ingredients. This includes things like chicken, dairy, eggs, beef and fish, as well as corn or wheat. Limited ingredient dog food (often abbreviated LIDs) are typically made without these ingredients. In fact, they’re generally made with relatively few ingredients at all and are often grain-free. LIDs generally feature an unusual protein (often called a novel protein, as your dog is unlikely to have eaten it before, and therefore it will not trigger an allergic reaction). Such foods also generally include low-risk carbohydrates (rice, for example, rarely triggers allergic reactions in dogs) and a small number of fruits and vegetables to supply the vitamin and mineral content. Limited ingredient dog foods are often the first option for owners of dogs with food allergies, as they frequently provide relief of skin allergies, don’t require a prescription and are usually priced comparably to typical premium dog foods. Note that while LIDs are often helpful for treating dogs with food allergies, and they’re often marketed as “hypoallergenic” dog foods, they can still trigger allergic reactions if your dog happens to be allergic to one of the included ingredients. The only truly “hypoallergenic” dog foods are those made with hydrolyzed proteins. Hydrolyzed proteins have been chemically altered to change the size and shape of the constituent protein molecules. This helps prevent the immune system from recognizing the offending ingredient and prevent the allergic response from happening. Like limited ingredient diets, these recipes typically feature low-risk carbohydrates like rice. Many foods with hydrolyzed proteins are only available with a veterinary prescription. There are a few over-the-counter options available, but most are only available with your vet’s assistance. Whether they are available over the counter or require a prescription, hydrolyzed protein foods are often quite expensive — sometimes prohibitively so. If you’d like to try a hydrolyzed protein food for your dog, we’d recommend Royal Canin HP Hypoallergenic Hydrolyzed Protein Dog Food. However, most owners will likely prefer to try a LID first, given the lower price point. How to Choose a Dog Food for Allergies? The fewer ingredients contained in a food, the lower the odds are that one of those ingredients will trigger an allergic reaction from your dog. It’s still important to provide your dog with all of the vitamins, minerals and calories he needs, so be sure to select only high-quality, nutritious foods that have been formulated to provide complete and balanced nutrition. The best LID options are made with unusual protein sources, to which your dog has not developed an allergy. Some of the most common examples include kangaroo, lamb, rabbit, salmon, venison and bison/buffalo. In the interest of limiting your dog’s exposure to potential allergens, most hypoallergenic dog foods are made with only a single protein source. However, multiple protein sources are not necessarily a problem if they are both from novel sources. For example, you’ll want to avoid foods that contain chicken and beef, but lamb and bison or salmon and rabbit are probably not a problem. Although it isn’t terribly common, some dogs suffer allergic reactions when exposed to artificial additives, such as colors, flavors or preservatives. Accordingly, most high-quality hypoallergenic dog foods are made without these types of items. Generally speaking, you’ll want to avoid foods that contain anything unnecessary. The best hypoallergenic dog foods are made in the US, Canada, Australia, New Zealand or Western Europe, as these countries maintain stricter quality-control and safety standards than many others. This is especially important for owners seeking a quality dog food for skin allergies, as low-quality manufacturers often produce foods that contain tainted ingredients. For example, the manufacturer may make a batch of standard dog food and then switch to making a hypoallergenic alternative. However, if they failed to properly sterilize the machinery between batches, the hypoallergenic food may contain trace amounts of your dog’s trigger. This could be enough to counteract the benefits provided by the hypoallergenic food. Again, it is important to understand that dog foods are only hypoallergenic if they feature hydrolyzed proteins or lack your dog’s specific trigger. And because hydrolyzed protein foods are not widely available without a prescription and cost significantly more than typical foods, we’ve selected only limited ingredient dog foods for our recommendations. Nevertheless, the following five hypoallergenic dog foods should give you a very good chance to treat your dog’s food allergies. About: P.S. Grain-Free Complete Dog Food is specifically designed to help put an end to your dog’s food allergies, and it also seeks to prevent yeast infections and other problems that cause itchy skin. User Reviews: P.S. Grain-Free Complete Dog Food received plenty of praise from most owners, and it clearly ranks among the best dog food for allergies available. Several reported that it was not only effective for resolving their dog’s itchy skin and paws, but it also appears to be quite palatable to dogs. However, a few noted that it is very important to transition to this diet carefully to avoid intestinal upset. Bottom Line: P.S. Grain-Free Complete Dog Food is clearly one of the best dog foods for allergies available without a prescription, and its formula is designed to address itchy skin in several different ways. It won’t work for all dogs, but the vast majority of owners reported that it was very effective for their pet. The only real drawback to the food is its high price. About: Rachael Ray Nutrish Just 6 is a limited ingredient diet, primarily based on six items. It is an excellent choice for owners who want one of the top hypoallergenic dog foods available, or those who simply like to feed their dog a food that doesn’t contain a lot of unnecessary ingredients. Ingredients: Lamb Meal, Brown Rice, Ground Rice, Dried Plain Beet Pulp, Natural Chicken Flavor, Poultry Fat (preserved with Mixed Tocopherols), Sodium Chloride, Potassium Chloride, Di-Calcium Phosphate, Zinc Proteinate, L-Ascorbyl-2-Polyphosphate (Source of Vitamin C), Vitamin E Supplement, Choline Chloride, Iron Proteinate, Zinc Sulfate, Manganese Proteinate, Copper Proteinate, Niacin Supplement, D-Calcium Pantothenate, Biotin, Sodium Selenite, Vitamin A Supplement, Riboflavin Supplement, Thiamine Mononitrate, Vitamin B12 Supplement, Calcium Iodate, Pyridoxine Hydrochloride (Source of Vitamin B6), Vitamin D3 Supplement, Folic Acid. User Reviews: Most owners who tried Rachael Ray Nutrish Just 6 were very pleased with the product. Most reported that it helped to soothe their dog’s itchy skin and many dogs who had trouble digesting other foods were able to eat this without any problem. The most common complaints related to palatability concerns, but most dogs seemed to love the taste. Bottom Line: Rachael Ray Nutrish Just 6 is a good choice for owners who want a limited ingredient diet that is also easy for dogs to digest. It appeared to help alleviate a wide variety of health problems from food allergies and food intolerances to IBS. About: Wellness Simple Natural Limited Ingredient Dog Food is a nutritious and delicious recipe, which is comprised of a relatively small number of primary ingredients. This makes it a helpful choice for many dogs who suffer from food allergies. Ingredients: Ground Rice, Lamb, Lamb Meal, Canola Oil (preserved with mixed tocopherols, a natural source of Vitamin E), Tomato Pomace, Dicalcium Phosphate, Potassium Chloride, Vitamins [Vitamin E Supplement, Beta-Carotene, Niacin, d-Calcium Pantothenate, Vitamin A Supplement, Riboflavin, Vitamin B-12 Supplement, Pyridoxine Hydrochloride, Thiamine Mononitrate, Vitamin D-3 Supplement, Folic Acid], Minerals [Zinc Proteinate, Zinc Sulfate, Iron Proteinate, Ferrous Sulfate, Copper Sulfate, Copper Proteinate, Manganese Proteinate, Manganese Sulfate, Calcium Iodate, Sodium Selenite], Choline Chloride, Taurine. User Reviews: The user reviews for Wellness Simple Limited Ingredient Dog Food were overwhelmingly positive. 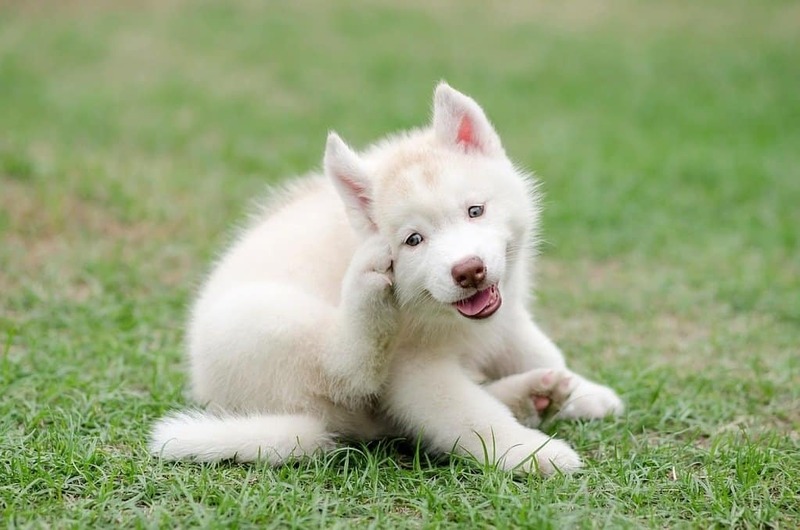 Most owners reported that the recipe not only relieved their dog’s itchy skin, but it helped improve their elimination habits and a few owners even reported improved energy levels. Additionally, the recipe appears very palatable to dogs, so you shouldn’t have any issues getting your pet to switch foods. Bottom Line: While it is slightly troubling that rice leads the ingredient list instead of lamb and we’d have liked to see probiotics included in the recipe, Wellness Simple Limited Ingredient Dog Food is clearly one of the best dog foods for skin allergies on the market, and it is priced very reasonably, given its quality. It deserves serious consideration by any owner trying to address food allergies or itchy skin. About: CANIDAE Grain-Free PURE Dog Food is a limited ingredient diet that is formulated from seven primary, whole foods to help alleviate problems with food allergies. This recipe includes two primary proteins, which are both typically good options for dogs with food allergies. User Reviews: Most owners reported great results after switching to CANIDAE Grain-Free PURE Dog Food. It not only helped to alleviate the itchy skin from which many dogs suffered, and it also helped to promote proper digestion and regular eliminations. Most owners also reported that their pet seemed to love the taste. In fact, most of the negative reviews related to one-off shipping or packaging problems, which can occur with any dog food. Bottom Line: CANIDAE’s Grain-Free PURE Dog Food contains more ingredients than many other limited ingredient diets, but it still appeared to alleviate most dogs’ food allergy problems. We’d have preferred if the recipe only included one protein, but lamb and bison are typically good novel proteins, so this isn’t as big of a problem as it would be if the proteins were more common items, such as chicken and beef. About: Instinct Limited Ingredient Grain-Free Recipe is a high-quality food designed to keep dogs nourished without including any of the most common allergic triggers. However, despite being a limited ingredient diet, it includes a number of rarely incorporated yet health-supporting items, such as freeze-dried organ meats and pumpkin seeds. User Reviews: Most owners were very happy with Instinct Limited Ingredient Grain-Free Diet and reported that it helped to alleviate their dog’s itchy skin. Most dogs appear to love the taste, likely because of the numerous organ meats included at the end of the ingredient list. Bottom Line: We’d have liked to see this recipe include real lamb meat at the top of the ingredient list, but the organ meats help offset this concern somewhat. As long as your dog doesn’t turn out to be allergic to lamb, this food will likely help put an end to his itchy skin, as it avoids some of the triggers (such as potatoes, dairy and eggs) which are still contained in many other LID foods. Food allergies in dogs can be frustrating to treat, but with your vet’s help and use of a quality hypoallergenic dog food, you should be able to provide your dog with some relief. Don’t forget that you’ll want to eliminate any human foods and treats (except for hypoallergenic varieties) until you get your dog’s food allergies under control. Have you found a dog food for allergies that worked for your pet? We’d love to hear all about it in the comments below.